Mindy Carson (born July 16, 1927), was an American traditional pop vocalist, who was heard often on radio during the 1940s and 1950s. 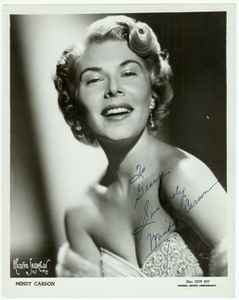 She was an occasional duet partner with Guy Mitchell and a solo artist in her own right. In August 1955, she scored a hit when her recording of "Wake the Town and Tell the People" reached #13, despite the fact that the trends in popular music were moving to rock & roll and she was not a rock singer. She had only one more hit, Ivory Joe Hunter's "Since I Met You Baby" in 1957, and by 1960 she had finished her recording career.